A 14-year-old with botulism. Note the weakness of his eye muscles and the drooping eyelids in the adjacent image, and the large and non moving pupils in the right image. This youth was fully conscious. Botulism is a rare and potentially fatal illness caused by a toxin, produced by the bacterium Clostridium botulinum. The disease begins with weakness, trouble seeing, feeling tired, and trouble speaking. This may then be followed by weakness of the arms, chest muscles, and legs. The disease does not usually affect consciousness or cause a fever. Botulism can be spread several different ways. The bacterial spores which cause it are common in both soil and water. They produce the botulinum toxin when exposed to low oxygen levels and certain temperatures. Foodborne botulism happens when food containing the toxin is eaten. Infant botulism happens when the bacteria develops in the intestines and releases the toxin. This typically only occurs in children less than six months old, as protective mechanisms develop after that time. Wound botulism is found most often among those who inject street drugs. In this situation, spores enter a wound, and in the absence of oxygen, release the toxin. It is not passed directly between people. The diagnosis is confirmed by finding the toxin or bacteria in the person in question. Prevention is primarily by proper food preparation. The toxin, though not the organism, is destroyed by heating it to more than 85 °C (185 °F) for longer than 5 minutes. Honey can contain the organism, and for this reason, honey should not be fed to children under 12 months. Treatment is with an antitoxin. In those who lose their ability to breathe on their own, mechanical ventilation may be necessary for months. Antibiotics may be used for wound botulism. Death occurs in 5 to 10% of people. Botulism can affect many other animals. The word is from Latin, botulus, meaning sausage. The muscle weakness of botulism characteristically starts in the muscles supplied by the cranial nerves—a group of twelve nerves that control eye movements, the facial muscles and the muscles controlling chewing and swallowing. Double vision, drooping of both eyelids, loss of facial expression and swallowing problems may therefore occur. In addition to affecting the voluntary muscles, it can also cause disruptions in the autonomic nervous system. This is experienced as a dry mouth and throat (due to decreased production of saliva), postural hypotension (decreased blood pressure on standing, with resultant lightheadedness and risk of blackouts), and eventually constipation (due to decreased peristalsis). Some of the toxins (B and E) also precipitate nausea, vomiting, and difficulty with talking. The weakness then spreads to the arms (starting in the shoulders and proceeding to the forearms) and legs (again from the thighs down to the feet). Severe botulism leads to reduced movement of the muscles of respiration, and hence problems with gas exchange. This may be experienced as dyspnea (difficulty breathing), but when severe can lead to respiratory failure, due to the buildup of unexhaled carbon dioxide and its resultant depressant effect on the brain. This may lead to coma and eventually death if untreated. 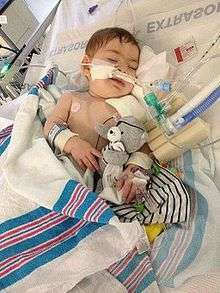 Infant botulism (also referred to as floppy baby syndrome) was first recognized in 1976, and is the most common form of botulism in the United States. There were 17 diagnosed cases of infant botulism in the United States in 2013. Infants are susceptible to infant botulism in the first year of life, with more than 90% of cases occurring in infants younger than six months. Infant botulism results from the ingestion of the C. botulinum spores, and subsequent colonization of the small intestine. The infant gut may be colonized when the composition of the intestinal microflora (normal flora) is insufficient to competitively inhibit the growth of C. botulinum and levels of bile acids (which normally inhibit clostridial growth) are lower than later in life. Infant botulism has no long-term side effects, but can be complicated by hospital-acquired infections. The case fatality rate is less than 1% for hospitalized infants with botulism. Botulism can result in death due to respiratory failure. However, in the past 50 years, the proportion of patients with botulism who die has fallen from about 50% to 7% due to improved supportive care. A patient with severe botulism may require mechanical ventilation (breathing support through a ventilator) as well as intensive medical and nursing care, sometimes for several months. The respiratory failure and paralysis that occur with severe botulism may require a person to be on a breathing machine (ventilator) for weeks or months. The person may require rehabilitation therapy after leaving the hospital. Clostridium botulinum is an anaerobic, Gram positive, spore-forming rod. Botulinum toxin is one of the most powerful known toxins: about one microgram is lethal to humans when inhaled. It acts by blocking nerve function (neuromuscular blockade) through inhibition of the excitatory neurotransmitter acetylcholine's release from the presynaptic membrane of neuromuscular junctions in the somatic nervous system. This causes paralysis. Advanced botulism can cause respiratory failure by paralysing the muscles of the chest; this can progress to respiratory arrest. In all cases, illness is caused by the botulinum toxin produced by the bacterium C. botulinum in anaerobic conditions and not by the bacterium itself. The pattern of damage occurs because the toxin affects nerves that fire (depolarise) at a higher frequency first. Toxin that is produced by the bacterium within containers of food that have been improperly preserved is the most common cause of food-borne botulism. Fish that has been pickled without the salinity or acidity of brine that contains acetic acid and high sodium levels, as well as smoked fish stored at too high a temperature, presents a risk, as does improperly canned food. Food borne botulism results from contaminated food in which C. botulinum spores have been allowed to germinate in low-oxygen conditions. This typically occurs in home-canned food substances and fermented uncooked dishes. Given that multiple people often consume food from the same source, it is common for more than a single person to be affected simultaneously. Symptoms usually appear 12–36 hours after eating, but can also appear within 2 hours to 10 days. There are eight serological varieties of the bacterium denoted by the letters A to H. The toxin from all of these acts in the same way and produces similar symptoms: the motor nerve endings are prevented from releasing acetylcholine, causing flaccid paralysis and symptoms of blurred vision, ptosis, nausea, vomiting, diarrhea and/or constipation, cramps, and respiratory difficulty. In October 2013, scientists released news of the discovery of type H, the first new botulism neurotoxin found in forty years. However, further information about type H has not been disclosed because of its potential for abuse as a lethal bioweapon and lack of a known antitoxin. While commercially canned goods are required to undergo a "botulinum cook" in a pressure cooker at 121 °C (250 °F) for 3 minutes, and so rarely cause botulism, there have been notable exceptions such as the 1978 Alaskan salmon outbreak and the 2007 Castleberry's Food Company outbreak. Foodborne botulism is the rarest form though, accounting for only around 15% of cases (US) and has more frequently been from home-canned foods with low acid content, such as carrot juice, asparagus, green beans, beets, and corn. However, outbreaks of botulism have resulted from more unusual sources. In July 2002, fourteen Alaskans ate muktuk (whale meat) from a beached whale, and eight of them developed symptoms of botulism, two of them requiring mechanical ventilation. Other, but much rarer sources of infection (about every decade in the US) include garlic or herbs stored covered in oil without acidification, chili peppers, improperly handled baked potatoes wrapped in aluminum foil, tomatoes, and home-canned or fermented fish. Oils infused with fresh garlic or herbs should be acidified and refrigerated. Potatoes which have been baked while wrapped in aluminum foil should be kept hot until served or refrigerated. Because the botulism toxin is destroyed by high temperatures, home-canned foods are best boiled for 10 minutes before eating. Metal cans containing food in which bacteria, possibly botulinum, are growing may bulge outwards due to gas production from bacterial growth; such cans should be discarded. Any container of food which has been heat-treated and then assumed to be airtight which shows signs of not being so, e.g., metal cans with pinprick holes from rust or mechanical damage, should also be discarded. Contamination of a canned food solely with C. botulinum may not cause any visual defects (e.g. bulging). Only sufficient thermal processing during production should be used as a food safety control. There is a vaccine but its usefulness is unclear as it is associated with significant adverse effects. As of 2013 there are efforts ongoing to develop a better vaccine. In some abnormal cases, physicians may try to remove contaminated food still in the digestive tract by inducing vomiting and/or using enemas. Wounds should be treated, usually surgically, to remove the source of the toxin-producing bacteria. In adults, botulism can be treated by passive immunization with a horse-derived antitoxin, which blocks the action of the toxin circulating in the blood. A trivalent antitoxin containing antibodies raised against botulinum toxin types A, B, and E is used most commonly, however a heptavalent botulism antitoxin has also been developed and was approved by the U.S. FDA in 2013. In infants, horse-derived antitoxin is sometimes avoided for fear of infants developing serum sickness or lasting hypersensitivity to horse-derived proteins. To avoid this, a human-derived antitoxin has been developed and approved by the U.S. FDA in 2003 for the treatment of infant botulism. This human-derived antitoxin has been shown to be both safe and effective for the treatment of infant botulism. However, the danger of equine-derived antitoxin to infants has not been clearly established, and one study showed the equine-derived antitoxin to be both safe and effective for the treatment of infant botulism. The paralysis caused by botulism can persist for 2 to 8 weeks, during which supportive care and ventilation may be necessary to keep the patient alive. Botulism is fatal in 5 to 10% of people who are affected. However, if left untreated, botulism is fatal in 40 to 50% of cases. The mortality rate for wound botulism is about 10%. Infant botulism has no long-term side effects but can be complicated by nosocomial adverse events. The case fatality rate is less than 1% for hospitalized infants with botulism. In part because the vast majority of infants with botulism are hospitalized, the overall infant botulism mortality rate is about 1.3%. Globally, botulism is fairly rare. In the United States, for example, an average of 145 cases are reported each year. Of these, roughly 65% are infant botulism, 20% are wound botulism, and 15% are foodborne. Infant botulism is predominantly sporadic and not associated with epidemics, but great geographic variability exists. From 1974 to 1996, for example, 47.2% of all infant botulism cases reported in the U.S. occurred in California. 1971 Bon Vivant botulism case On July 2, 1971, the U.S. Food and Drug Administration (FDA) released a public warning after learning that a New York man had died and his wife had become seriously ill due to botulism after eating a can of Bon Vivant vichyssoise soup. The largest recorded outbreak of foodborne botulism in the United Kingdom occurred in June 1989. A total of 27 patients were affected; one patient died. Twenty-five of the patients had eaten one brand of hazelnut yogurt in the week before the onset of symptoms. This yogurt contained hazelnut conserve sweetened with aspartame rather than sugar. Control measures included the cessation of all yogurt production by the implicated producer, the withdrawal of the firm's yogurts from sale, the recall of cans of the hazelnut conserve, and advice to the general public to avoid the consumption of all hazelnut yogurts. Death from botulism is common in waterfowl; an estimated 10,000 to 100,000 birds die of botulism annually. In some large outbreaks, a million or more birds may die. Ducks appear to be affected most often. Botulism also affects commercially raised poultry. In chickens, the mortality rate varies from a few birds to 40% of the flock. 1 2 3 4 5 6 7 "Botulism Fact sheet N°270". World Health Organization. August 2013. Retrieved 24 February 2014. ↑ Lewis, Charlton T.; Short, Charles. "A Latin Dictionary". Retrieved 2014-06-09. 1 2 3 4 5 6 7 8 9 10 Sobel, J. (2005). "Botulism". Clinical Infectious Diseases. 41 (8): 1167–73. doi:10.1086/444507. PMID 16163636. ↑ "Botulism". OutbreakID.com. Archived from the original on 2 April 2012. 1 2 Arnon SS (2004). "Infant Botulism". In Feigin RD; Cherry JD; Demmler GJ; Kaplan SL. Textbook of Pediatric Infectious Diseases (PDF) (5th ed.). Philadelphia, PA: WB Saunders. pp. 1758–1766. 1 2 Caya, James G.; Agni, Rashmi; Miller, Joan E. (2004). "Clostridium botulinum and the Clinical Laboratorian: A Detailed Review of Botulism, Including Biological Warfare Ramifications of Botulinum Toxin". Archives of Pathology & Laboratory Medicine. 128 (6): 653–62. doi:10.1043/1543-2165(2004)128<653:CBATCL>2.0.CO;2. PMID 15163234. Retrieved 21 June 2016. 1 2 "Infant Botulism". kidshealth.org. Retrieved 2016-09-28. ↑ Koepke, R.; Sobel, J.; Arnon, S. S. (2008). "Global Occurrence of Infant Botulism, 1976–2006". Pediatrics. 122 (1): e73–82. doi:10.1542/peds.2007-1827. PMID 18595978. ↑ "Clostridium perfringens". U.S. Centers for Disease Control and Prevention. Retrieved 14 June 2016. ↑ Donald Emmeluth (2010). Botulism. Infobase Publishing. p. 38. ISBN 978-1-60413-235-9. 1 2 Arnon, Stephen S.; Schechter, Robert; Inglesby, Thomas V.; Henderson, Donald A.; Bartlett, John G.; Ascher, Michael S.; Eitzen, Edward; Fine, Anne D.; Hauer, Jerome; Layton, Marcelle; Lillibridge, Scott; Osterholm, Michael T.; O'Toole, Tara; Parker, Gerald; Perl, Trish M.; Russell, Philip K.; Swerdlow, David L.; Tonat, Kevin (2001). "Botulinum toxin as a biological weapon: medical and public health management". JAMA. 285 (8): 1059–70. doi:10.1001/jama.285.8.1059. PMID 11209178. ↑ "CDC – Botulism, General Information". Centers for Disease Control and Prevention. Retrieved 2016-08-05. ↑ "Facts About Botulism". Emergency Preparedness and Response. Centers for Disease Control and Prevention. Oct 14, 2001. Retrieved Jul 2, 2011. ↑ Tamparo, Carol. Diseases of the Human Body (5th ed.). Philadelphia, PA. p. 68. ISBN 978-0-8036-2505-1. 1 2 "ETOX 80E -Botulism". University of California, Santa Cruz. Retrieved 2014-02-12. ↑ Grenoble, Ryan (2013-10-17). "World's Deadliest Substance? New Variant Of Botulinum Toxin May Be It (VIDEO)". Huffingtonpost.com. Retrieved 2014-02-12. ↑ Ward, BQ; Carroll, BJ; Garrett, ES; Reese, GB (1967). "Survey of the U.S. Gulf Coast for the presence of Clostridium botulinum". Applied Microbiology. 15 (3): 629–36. PMC 546991 . PMID 5340653. ↑ Franson JC, Friend M. "38: Avian Botulism". Field Manual of Wildlife Disease (PDF). U.S. Geological Survey. ISBN 978-0-607-88096-0. Retrieved 14 June 2016. ↑ International Commission on Microbiological Specifications for Foods (1996). "Clostridium botulinum". Microorganisms in Foods 5: Characteristics of Microbial Pathogens. Springer. pp. 66–111. ISBN 978-0-412-47350-0. quoted in Centers for Disease Control Prevention (CDC) (2012). "Botulism from drinking prison-made illicit alcohol – Utah 2011". MMWR. 61 (39): 782–4. PMID 23034585. ↑ Weber, JT (1994). "Botulism". In Hpeprich, PD. Infectious Diseases (5th ed.). J. B. Lippincott Company. pp. 1185–1194. ↑ "Botulism". WHO. Retrieved 2014-02-12. ↑ "Foodborne Botulism FAQ". Food Safety Authority of Ireland. November 15, 2011. Retrieved 2014-05-20. ↑ Teotonio, Isabel (February 21, 2008). "Couple suing over tainted juice". Toronto Star. ↑ "Guidance for Industry: Refrigerated Carrot Juice and Other Refrigerated Low-Acid Juices". FDA. June 2007. ↑ Arnon, Stephen S.; Midura, Thaddeus F.; Damus, Karla; Thompson, Barbara; Wood, Ronald M.; Chin, James (1979). "Honey and other environmental risk factors for infant botulism". The Journal of Pediatrics. 94 (2): 331–6. doi:10.1016/S0022-3476(79)80863-X. PMID 368301. 1 2 3 4 5 "CDC – Arctic Investigations Program – DPEI". Centers for Disease Control and Prevention (CDC). 2011-04-01. Retrieved 2014-02-12. ↑ Centers for Disease Control and Prevention (CDC) (January 2003). "Outbreak of botulism type E associated with eating a beached whale – Western Alaska, July 2002". MMWR Morb. Mortal. Wkly. Rep. 52 (2): 24–6. PMID 12608715. ↑ "Oil Infusions and the Risk of Botulism". Safefood News. Colorado State University Cooperative Extension. 1998. Archived from the original on 4 April 2013. ↑ Centers for Disease Control (CDC) (October 1985). "Update: international outbreak of restaurant-associated botulism – Vancouver, British Columbia, Canada". MMWR Morb. Mortal. Wkly. Rep. 34 (41): 643. PMID 3930945. ↑ "WA Health – Public Health – Botulism fact sheet". Department of Public Health, Western Australia. Retrieved 2014-02-12. ↑ U.S. Food and Drug Administration. "Bad Bug Book: Foodborne Pathogenic Microorganisms and Natural Toxins Handbook Clostridium botulinum". Retrieved 12 January 2013. ↑ Webb, Robert P; Smith, Leonard A (2013). "What next for botulism vaccine development?". Expert Review of Vaccines. 12 (5): 481–92. doi:10.1586/erv.13.37. PMID 23659297. 1 2 "Botulism: Treatment Overview for Clinicians". U.S. Centers for Disease Control and Prevention (CDC). 2006. Retrieved 13 January 2016. ↑ Brook, Itzhak (2006). "Botulism: the challenge of diagnosis and treatment". Reviews in Neurological Diseases. 3 (4): 182–9. PMID 17224901. ↑ Shapiro, Roger L. (1998). "Botulism in the United States: A Clinical and Epidemiologic Review". Annals of Internal Medicine. 129 (3): 221–8. doi:10.7326/0003-4819-129-3-199808010-00011. PMID 9696731. ↑ "FDA approves first Botulism Antitoxin for use in neutralizing all seven known botulinum nerve toxin serotypes". FDA News Release. U.S. FDA. 22 March 2013. Retrieved 14 January 2016. 1 2 Vanella de Cuetos EE; Fernandez RA; Bianco MI; Sartori OJ; Piovano ML; Luquez C; de Jong LIT (November 2011). "Equine Botulinum Antitoxin for the Treatment of Infant Botulism". Clin Vaccine Immunol. 18 (11): 1845–1849. doi:10.1128/CVI.05261-11. PMC 3209035 . PMID 21918119. 1 2 Arnon SS; Schechter R; Maslanka SE; Jewell NP; Hatheway CL (2006). "Human Botulism Immune Globulin for the Treatment of Infant Botulism". New England Journal of Medicine. 354 (5): 462–471. doi:10.1056/NEJMoa051926. PMID 16452558. 1 2 Chalk, Colin H; Benstead, Tim J; Keezer, Mark; Chalk, Colin H (2014). "Medical treatment for botulism". The Cochrane Database of Systematic Reviews. 2 (2): CD008123. doi:10.1002/14651858.CD008123.pub3. PMID 24558013. 1 2 3 "National Case Surveillance: National Botulism Surveillance | CDC National Surveillance". Centers for Disease Control and Prevention. 2013-06-25. Retrieved 2014-02-12. ↑ Sobel J, Tucker N, Sulka A, McLaughlin J, Maslanka S (September 2004). "Foodborne Botulism in the United States, 1990–2000". Emerging Infectious Diseases. Centers for Disease Control. 10 (9): 1606–11. doi:10.3201/eid1009.030745. PMC 3320287 . PMID 15498163. Retrieved 14 June 2016. ↑ Passaro, Douglas J.; Werner, Benson; McGee, Jim; Mac Kenzie, William R.; Vugia, Duc J. (1998). "Wound Botulism Associated With Black Tar Heroin Among Injecting Drug Users". JAMA. 279 (11): 859–63. doi:10.1001/jama.279.11.859. PMID 9516001. ↑ Terranova, William; Breman, Joel G.; Locey, Robert P.; Speck, Sarah (1978). "Botulism type B: epidemiologic aspects of an extensive outbreak". American Journal of Epidemiology. 108 (2): 150–6. PMID 707476. ↑ Angulo, F. J.; Getz, J.; Taylor, J. P.; Hendricks, K. A.; Hatheway, C. L.; Barth, S. S.; Solomon, H. M.; Larson, A. E.; Johnson, E. A.; Nickey, L. N.; Ries, A. A. (1998). "A Large Outbreak of Botulism: The Hazardous Baked Potato". Journal of Infectious Diseases. 178 (1): 172–7. doi:10.1086/515615. PMID 9652437. ↑ "1 dead in botulism outbreak linked to Ohio church potluck". CNNWIRE. CNN. 28 April 2015. Retrieved 19 July 2015. ↑ O'Mahony, M; Mitchell, E; Gilbert, RJ; Hutchinson, DN; Begg, NT; Rodhouse, JC; Morris, JE (1990). "An outbreak of foodborne botulism associated with contaminated hazelnut yoghurt". Epidemiology and Infection. 104 (3): 389–95. doi:10.1017/s0950268800047403. PMC 2271776 . PMID 2347382. ↑ Humeau Y, Doussau F, Grant NJ, Poulain B (May 2000). "How botulinum and tetanus neurotoxins block neurotransmitter release". Biochimie. 82 (5): 427–46. doi:10.1016/S0300-9084(00)00216-9. PMID 10865130. ↑ OCunha CE, Moreira GM, Salvarani FM, et al. (Jan 2014). "Vaccination of cattle with a recombinant bivalent toxoid against botulism serotypes C and D.". Vaccine. 32 (2): 214–216. doi:10.1016/j.vaccine.2013.11.025. PMID 24252701. ↑ "Dogs / Botulism". Vet Book. 2012-08-12. Retrieved 2013-08-23. ↑ "Overview of botulism in poultry". Merck Manuals. 2012-03-31. Retrieved 2013-08-23. ↑ S.E. Aiello; A. Mays, eds. (1988). "Botulism". Merck Veterinary Manual (8th ed.). Whitehouse Station, NJ: Merck and Co. pp. 442–444.